Shi (finger) atsu (pressure) is a Japanese therapy that uses pressure applied with thumb, finger and palms to the same energy meridians as Acupressure. Shiatsu helps you become in tune with your own body. 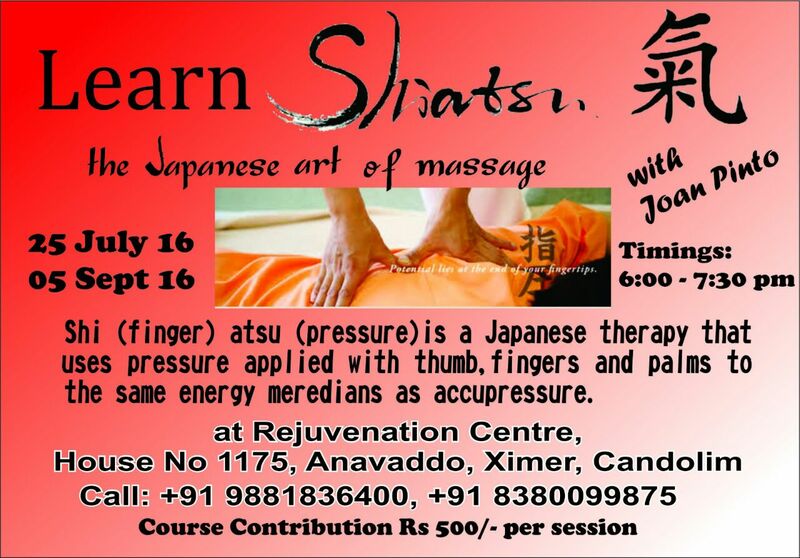 Shiatsu teaches you to use hands and fingers to relieve aches and pains. Shiatsu has no side effects. Shiatsu can be used for all ages. Shiatsu treats the whole body. Participants need wear loose fitting clothes. They need to cut their nails and bring a mat / sheet along, since the programme will be conducted on the floor. For further detail or to register, please contact Joan on 8380099875.